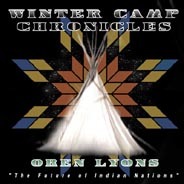 An Onondoga Chief of the Six Nations Iroquois and a respected leader in the Native American movement, Chief Lyons speaks and writes on a wide range of contemporary Native American issues. THE FUTURE OF INDIAN NATIONS, (74:00 min.s) recorded in a public forum Feb. 3, 1989 at Boulder, Colorado. In this speech Chief Lyons relates the survival and future of Native people to our responsibility in the greater common cause of the survival of humankind. "Listening to our chiefs council talk and sitting with the elders, in the traditional circle of elders that we meet once a year around this country. Talking, they figure that it's this generation. The one coming, and the one that's just past, that is going to decide whether there is going to be life very long on this Earth. In other words, us. We're the ones who are going to decide, whether there is going to be life. LISTEN to/or DOWNLOAD "The Future of Indian Nations" Speech!